By the summer of 1944 American forces in the Pacific had established two routes of attack in their drive toward Japan. In the Central Pacific Navy and Marine Corps units, with Army assistance, were "island-hopping" westward from Hawaii, taking the Gilbert Islands in a costly campaign in November 1943 and the Marshall Islands in January-February 1944. In the South and Southwest Pacific Areas, Army units, with Navy and Marine Corps support, had taken Guadalcanal and Bougainville in 1942-43 and, operating with Australian forces, had cleared northeast New Guinea and the Hollandia area of Netherlands New Guinea by May 1944. These victories brought American forces to the inner defense line of the Japanese Empire. In deciding where to breach that line, the Allies looked for a place that would not only puncture Japanese confidence but provide anchorages for naval support of subsequent operations and air bases for strikes against enemy industrial and military installations. The best islands for these purposes lay in the Western Pacific: the Marianas and the Palaus. sented the most direct route to the Philippines and would, at the same time, place American forces on the enemy line of communications between Japan and the oil-rich East Indies. King repeated his Central Pacific proposal at the Trident Conference in Washington in May, but it was neither approved nor rejected. A series of Allied planning conferences in 1943 failed to resolve the issue. 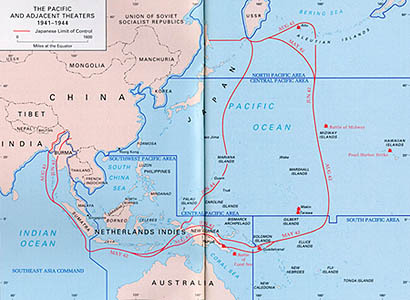 The strong identification of each strategy with a different military service-Central Pacific with the U.S. Navy and Southwest Pacific with the U.S. Army-tended to undermine an unbiased appraisal of either course-of action and to encourage the potentially dangerous pursuit of both with inadequate resources. Finally, toward the end of 1943, a technological development began to influence the issue. The Army Air Forces announced the imminent appearance of a new long-range bomber, the B-29. The new weapon strengthened the Central Pacific strategy, since the island chain particularly desired by Admiral King-the Marianas-lay 1,270 miles from Tokyo, comfortably within the l,500-mile radius of the new aircraft. At the second Cairo Conference in December 1943 the Allies thus approved seizure of the Marianas, tentatively scheduled for October 1944. Subsequent operations along this axis would include seizure of the Palaus to secure the flank for the turn northwest into the Philippines. Chamorro people into a new imperial order. First held by the Spanish since the late seventeenth century, then, except for Guam, passed to the Germans in 1899, the islands were taken by the Japanese during World War I, an occupation ratified by the Treaty of Versailles. Even before they left the League of Nations in 1935, the Japanese had begun fortifying the Marianas. By the 1940s the islands stood as a keystone in the defensive line around the Japanese Empire. The Imperial Japanese Navy exercised theater control over the Marianas and surrounding seas through its Central Pacific Area Fleet, commanded by Vice Adm. Chuichi Nagumo, leader of the Pearl Harbor strike force. The Imperial Japanese Army controlled all ground forces in the Marianas through its 31st Army, commanded by Lt. Gen. Hideyoshi Obata. Major subordinate commands were the 43d Division on Saipan and the 29th Division on Guam. Although both units were understrength, having lost several troop transports to American submarines, both were also augmented by a number of independent battalions and naval landing units. Japanese forces in the Marianas, both Imperial Army and Navy, totaled about 59,000 men. The Marianas campaign expanded United States Army operations in a theater commanded by the U.S. Navy. Admiral Nimitz assigned overall campaign responsibility to Vice Adm. Raymond A. Spruance's Fifth Fleet. Vice Adm. Richmond Kelly Turner would command the Joint Expeditionary Force charged with the amphibious assault. Turner himself would also command directly a Northern Attack Force against Saipan and Tinian, while a Southern Attack Force under Rear Adm. Richard L. Conolly would assault Guam. Vice Adm. Marc A. Mitscher's Fast Carrier Task Force and Vice Adm. Charles A. Lockwood's Submarine Force, Pacific Fleet, would cover all landings. Lt. Gen. Holland M. Smith, USMC, Commanding General, V Amphibious Corps, would control the Marianas amphibious forces as each left U.S. Navy control at the water's edge. Three Marine Corps general officers would command the landing forces on the targeted islands: Holland Smith on Saipan, Harry Schmidt on Tinian, and Roy S. Geiger on Guam. 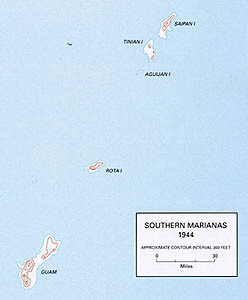 Amphibious units assigned to the Marianas included the 2d' 3d' and 4th Marine Divisions and a separate Marine brigade. Three major Army units-the 27th and 77th Infantry Divisions and XXIV Corps Artillery-were assigned from U.S. Army Forces in the Central Pacific Area, commanded by Lt. Gen. Robert C. Richardson, Jr. Army and Marine Corps units totaled 106,000 men. Naval support for this huge force included 110 transport vessels and auxiliaries and 88 fire support ships, from rocket gunboats to aircraft carriers. ridgelines framing a central valley planted in sugar cane. For invasion forces the major terrain features derived from the volcanic origin of the island. Unlike the low and generally flat surface of coral islands, the terrain of Saipan presented a confusion of heavily jungled and jagged but low cliff faces, rock outcroppings, sinkholes, and caves often as difficult to see as to walk over and around. The highest peaks were the volcanic cones whose eruptions formed the island: Mount Nafutan, 407 feet, to the southeast; Mount Kagman, about the same height, on the east coast; Mount Marpi, 833 feet, at the northern tip; and Mount Tapotchau, rising 1,554 feet on -the west side of the central valley. A small population, most of which the Japanese had enlisted in sugar cane farming, resided in three west coast villages: Charan Kanoa, near the south end of the island; Garapan at mid-coast; and Tanapag, six miles from Marpi Point. sonnel. Besides ample artillery and modest aircraft support, these forces could call on an armored regiment of forty-eight tanks. Lt. Gen. Yoshitsugu Saito commanded both the 43d Division and the entire Saipan defense force. 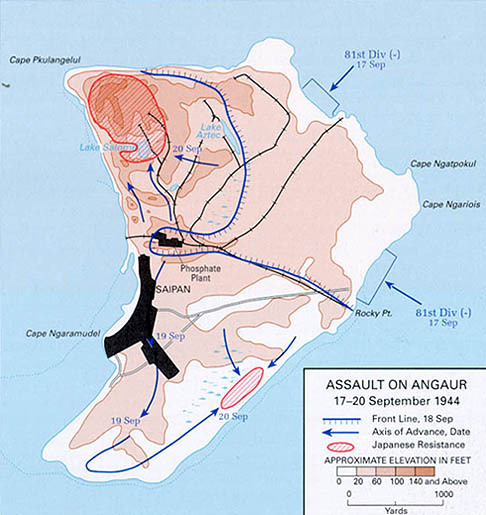 The small size of Saipan dictated a straightforward plan of assault. The 2d and 4th Marine Divisions would land on the southwest coast and stake out a beachhead. Joined by elements of the 27th Division, the corps would advance to the east coast, splitting enemy defenders into the northern half and southeast corners of the island. Army troops would clear the latter, then join the two Marine divisions for the drive north to Marpi Point. Admiral Spruance set the invasion date at 15 June. line. Under this rain of hot metal and terror the Japanese could do little but cower in their bunkers; only two artillery crews scored hits on U.S. Navy ships. A few sipped beer and sake as they recorded in diaries their awe of American firepower. At 0700 on 15 June the order "Land the landing force!" boomed through the compartments of thirty-four Landing Ship, Tanks, anchored three miles offshore. Bow doors swung open, ramps lowered and hundreds of amphibian tractors began crawling into the water. During the half-hour run to the beach the growling amphibians were preceded by carefully orchestrated barrages of large-caliber naval gunfire, boat-mounted rockets, and carrier air strikes, first on the beaches and then, as the troops came across the sand, in the hills beyond. Between 0843 and 0908 eight thousand marines landed on the west side of Saipan north and south of Charan Kanoa in the face of moderate opposition. They were brought ashore in 196 vehicles of the Army's 708th, 715th, and 773d Amphibian Tractor Battalions and their Marine Corps counterparts. The landing force was escorted by 138 armored amphibian tractors, or "amtracs," armed with 37-mm. or 75-mm. cannons which, it was hoped, would enable them to act as tanks ashore. By nightfall the marines had established a beachhead 10,000 yards wide and 1,000 yards deep. Helping to organize the beach were the first Army units ashore: the 311th and 539th Port Companies. That night the Japanese counterattacked at six points but were repulsed everywhere. The next day the first Army combat units came ashore: the 165th Infantry and the 105th, 106th, and 249th Field Artillery Battalions. The marines shifted left to make room for the 165th Infantry, whose mission was to sweep the southern shore of the island and take Aslito Field. As the drive across the island began, the corps front included from left (north) to right the 2d Marine Division, the 4th Marine Division, and the 165th Infantry. As the 165th and the marines approached the airfield, enemy opposition stiffened. That night the enemy counterattacked with 1,000 troops and 38 tanks but was again repulsed. 12 headquarters, the Japanese attempted a novel departure from doctrine: a counteramphibious landing that began with a sortie of small boats southward toward the American beachhead from Tanapag Harbor eight miles upcoast. Surprised at the gift of easy targets, Navy gunboats and Marine artillery destroyed most of the enemy boats and drove the rest back to Tanapag. Resuming the offensive at noon, the 165th Infantry and the 4th Marine Division completed the move across the island against feeble resistance. On 19 June Holland Smith reoriented his corps to attack in two directions. His two Marine divisions and one regiment of the 27th Division formed a front across the island in preparation for the advance north. The other two regiments of the 27th Division, the 105th and the 165th began the mop-up of Nafutan Peninsula. While this redeployment proceeded' the American ground effort was greatly assisted by a naval action 600 miles to the west. On 19-20 June Admiral Mitscher's fast carriers intercepted a large enemy carrier task force. In a one-sided battle that became known as the "Great Marianas Turkey Shoot," American pilots and shipboard gunners shot down 385 of a total of 545 planes launched by the enemy and sank 1 carrier and 2 oilers. American submarines later sank 2 more carriers. Another 17 enemy planes were destroyed on Guam landing strips. The U.S. Navy lost 26 planes and 54 men. The Battle of the Philippine Sea so severely crippled the Imperial Japanese Navy that Japanese ground units in the Marianas would have to fight on with no hope of resupply. On Nafutan Peninsula the two Army regiments encountered unexpected resistance. With jagged terrain and poor coordination creating gaps in the American advance, the Japanese easily stopped the troops with only machine gun and mortar fire. Sugar cane obstructed visibility and had to be burned' forcing more halts. Too often, small terrain gains were given up when battalion commanders thought themselves in awkward positions at nightfall. With little to show for two days of fighting by the Army troops, Holland Smith began to lose patience. Anxious to start the advance north, he transferred the 165th Infantry and one battalion of the 105th to the central front. To compensate, he sent six light tanks to Nafutan. As Holland Smith reoriented for his push north, General Saito redeployed to block the Americans. He placed his battered units- some of which had suffered over 50 percent casualties-in a new defense line anchored on Mount Tapotchau. Already in a hopeless situation-there was no longer any chance the Japanese would see a friendly plane or ship-Saito's troops still had two sources of strength: ideal defensive terrain and a willingness to fight to the death. Holland Smith launched his corps attack at 0600 on 22 June. The two Marine divisions advanced a mile and a half against light resistance and halted for the night. The next morning the 4th Marine Division shifted right to give the 27th Division a two-mile front in the center of the island. As the 106th and 165th Infantry regiments moved forward to assigned sectors, their columns crossed and tangled. The time required to unscramble the units delayed the corps attack nearly an hour. Under way late in the morning, the offensive soon bogged down when Army battalions ran into the same combination of machine gun and mortar fire that was stopping their comrades to the south. In an effort to restore momentum, the corps commander transferred another Army battalion to the central front, leaving only the 2d Battalion, 105th Infantry, for the Nafutan mop-up. Soon more bad news came from Nafutan. Holland Smith learned that although the entire 105th Infantry was under corps tactical control, the 27th Division commander, Ralph Smith, was still giving orders to the 2d Battalion of that regiment. 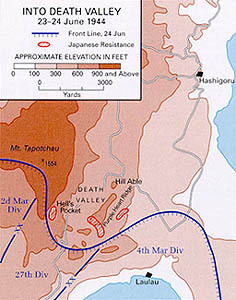 Throughout 23 June, the 27th Division made little progress north. On the right, the 165th Infantry dug in for the night only some 700 yards ahead of its jump-off point. On the left, the 106th Infantry had advanced just 100 yards. 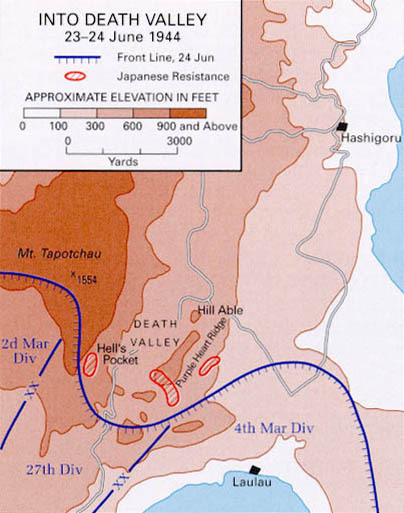 The fighting was focused on three areas: a small cove in the mountain on the left, named "Hell's Pocket"; a line of hills on the right labeled "Purple Heart Ridge"; and the open expanse to the front dubbed "Death Valley." In Purple Heart Ridge and other areas, the Japanese were using caves as delaying rather than as fighting positions. Rather than simply fighting from the cave mouths, some enemy troops were remaining deep in the passages during daylight, then coming out to make night raids on American rear areas. On the night of the 23d3 several enemy tanks added to the 27th Division's frustration. One managed to penetrate the division's front and score a lucky hit on an ammunition dump. Explosions and fires drew more enemy fire, and the 106th Infantry had to withdraw in the darkness, canceling its small but hard-fought gains of the day. The performance of Army regiments in central Saipan greatly troubled Holland Smith. The 27th Division had fallen more than a mile behind the two Marine divisions on the flanks, and the entire corps advance would have to stop until the deep bend in the middle of the line could be straightened. No longer confident of the 27th Division's leadership, the corps commander took the drastic step of relieving Ralph Smith, the division commander, on 24 June. Army Maj. Gen. Sanderford Jarman took over the division on an interim basis. The relief of an Army general by a Marine Corps general touched off one of the most unfortunate incidents of the entire Pacific war. The "Smith versus Smith controversy," as it came to be known, threatened Army-Navy cooperation even more than had the Japanese attack on Pearl Harbor. Holland Smith felt justified in relieving his Army subordinate primarily because of the poor battlefield performance of the Army division. Battalions of the 27th Division had displayed he believed insufficient aggressiveness both on the central front and at Nafutan Point. They were repeatedly late in beginning attacks, easily pinned down, and quick to withdraw, while at the same time Marine units were gaining more ground although at higher cost in casualties. The corps commander saw no alternative to replacing the division commander, but the action soured interservice relations in a theater where smooth coordination was essential. tanks and 40-mm. gun mount crews dashed in front of enemy positions to fire point-blank into cave mouths, with flamethrower teams completing the attack by firing jellied gasoline into openings. On the 27th good news came from both fronts. In the morning the 2d Battalion, 105th Infantry, overcame the last enemy strongpoint on Nafutan Peninsula. In Death Valley the 1st Battalion, 106th Infantry, cleared most of Hell's Pocket, while the other two battalions of the 106th and the 2d Battalion, 165th Infantry, secured all but the last rise on Purple Heart Ridge, "Hill Able." The next day Maj. Gen. George W. Griner took command of the 27th Division and soon could report a victory to Holland Smith when the 1st Battalion, 106th Infantry, killed the last enemy soldier in Hell's Pocket. Building momentum, Griner's men shrugged off an enemy attack on the 106th Infantry but had to halt when the 3d Battalion, 105th Infantry, was hit by friendly artillery. Finally, on the 30th, the 2d Battalion, 165th Infantry, topped Hill Able, and the 27th Division earned praise from Holland Smith for clearing Hell's Pocket, Death Valley, and Purple Heart Ridge. Now only a six-mile sweep to Marpi Point remained. Against feeble opposition-the 3,000 or so remaining Japanese had no artillery or armor and little water-the Americans moved ahead rapidly. The narrowing of the island reduced the corps front to two divisions, the 27th on the left shore, the 4th Marine on the right. Army troops found the next Japanese line in a ravine just beyond Tanapag village. Repeated attacks by two battalions and several tanks over two days finally wore down the enemy. After seeing wounded Japanese shoot comrades and explode grenades against themselves, American troops named the cut Suicide Gulch. Moving beyond Tanapag, Griner's men found fortified cliffs and caves abutting the beach. But in the hard school of Death Valley, Army troops had mastered tank-infantry coordination, and they cleaned out the cliffs in one day. His troops backed against the sea, General Saito ordered one more assault by all still able to walk, then he literally fell on his sword. In the predawn darkness of 7 July, several thousand enemy soldiers lunged into the 1st and 2d Battalions of the 105th Infantry. Here the Japanese learned the Americans could be just as tenacious in the defense as they had been on Purple Heart Ridge. At the approach of the enemy Lt. Col. William J. O'Brien rallied his men by running along his perimeter firing pistols at the attackers. When his ammunition ran out, he continued with a machine gun until he was killed. Elsewhere on the line, Sgt. Thomas A. Baker was severely wounded in the enemy onslaught. Refusing evacuation, he demanded only a loaded pistol. When his comrades returned they found eight Japanese bodies around his own. For their extraordinary demonstrations of heroism, O'Brien and Baker were posthumously awarded the Medal of Honor. For his counterattack, Griner sent in the 106th Infantry with tanks. In another day-long battle the Americans regained lost terrain and in the process nearly annihilated the enemy. Two days of little more than cave demolition brought the 165th Infantry and Marine Corps units to Marpi Point, ending the battle for Saipan. In the closing scene of their futile defense, the Japanese gave another gruesome demonstration of fanaticism. Driven to the beaches, dozens of enemy survivors swam to reefs rather than accept food and medical care, then committed suicide before incredulous Americans. The struggle for Saipan cost the Army 3,674 killed, wounded, and missing, while Marine casualties totaled 10,437. 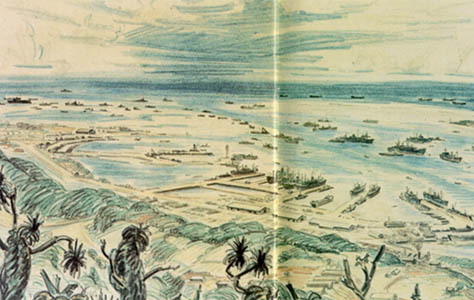 When Admiral Turner declared the island secure on 9 July, the Army had more experienced units, and the men of the 27th Division had learned how to overcome some of the toughest Japanese defenses in the Pacific. Only 3.5 miles to the south and two-thirds the size of Saipan, Tinian presents a land surface markedly different from its neighboring island. Despite its volcanic origin, Tinian is unusually flat, with Mount Lasso the highest peak at 564 feet. Few natural obstacles exist. The Japanese had already built three airfields and easily controlled the small native population, which lived in sugar cane settlements and Tinian Town. Only the act of landing itself would be a problem, since about 90 percent of the coastline is cliff face. ies. For this phase of the Western Pacific Campaign a clear distinction of missions by service prevailed. The marines were given all infantry missions, while Army units were to provide artillery and engineer support. The marines would bring ashore only light artillery-75-mm. pack howitzers. Brig. Gen. Arthur M. Harper's XXIV Corps Artillery would contribute heavier support from thirteen battalions of 105-mm. and 155-mm. pieces, in all 156 guns initially firing from Saipan. 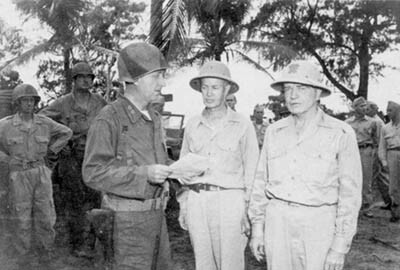 Anxious to continue the momentum of their victory on Saipan, Admiral Turner and Lt. Gen. Holland Smith quickly turned their attention to Tinian. Only five days after the invasion of Saipan, Battery B. 531st Field Artillery Battalion, had begun firing its 155-mm. guns at Tinian. 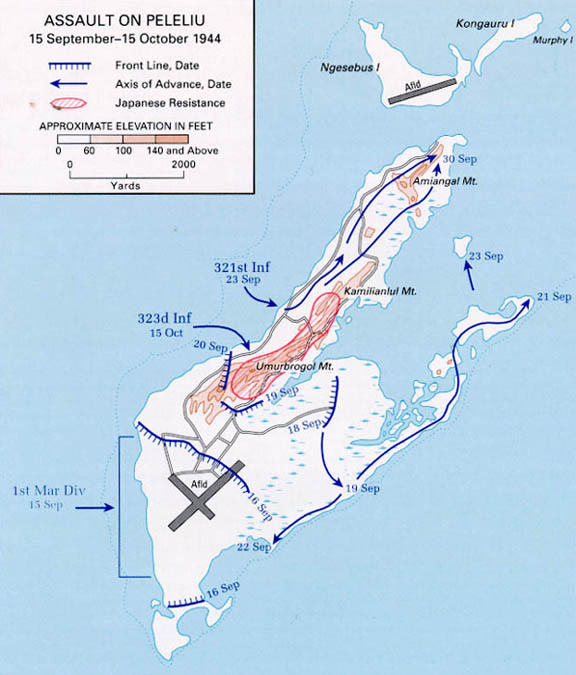 On 8 July three more Army artillery battalions reoriented southward, and by the time fighting on Saipan ended XXIV Corps Artillery would have fired 331 missions-over 7,500 rounds-at Tinian from Saipan. On the morning of 24 July the two Marine divisions landed under the command of Lt. Gen. Harry F. Schmidt, USMC. Of the 415 amphibious vehicles used to bring the troops ashore, 225 came from the Army's 534th, 715th, and 773d Amphibian Tractor Battalions. The Army's 708th Amphibian Tank Battalion stood by offshore, ready to land and support the infantry. As the marines pushed beyond the shoreline, the Army's 1341st Engineer Battalion administered the beach, sending personnel and supplies inland and transferring casualties to ships. Overcoming light opposition, the marines established a beachhead two miles wide and a mile deep by nightfall. As on Saipan, the Japanese tried to push the Americans back into the sea their first night ashore, but once again the enemy failed, losing 1,241 men in the attempt. Thereafter the rolling terrain allowed a rapid infantry-armor advance, leaving the Japanese defenders little time to reorganize their crumbling defenses. On the 26th the marines captured their first airfield and cleared Mount Lasso, but the galloping advance was finally slowed by the weather. On 29 July the tail of a typhoon lashed across the island, destroying two ponton causeways used to receive shipborne units and supplies from Saipan, preventing two batteries of the Army's 106th Field Artillery Battalion from reaching Tinian. However, the third battery of the 106th and all of the 419th Field Artillery Group had already arrived. over one hundred enemy dead, and on the evening of 1 August General Schmidt declared the island secure. While airfield improvement progressed3 the troops carried out a difficult mop-up operation which by year's end had accounted for 542 more Japanese soldiers on the island. The nine-day battle for Tinian cost the attackers 328 killed and 1,571 wounded. For this high price, Marine Corps infantry and Army artillery had gained one of the best island air bases in all the Pacific. From Tinian long-range American bombers would soon bring the war to the enemy's home islands, ending all hopes of Japanese resurgence. Thirty-four miles long and between five and nine miles wide, Guam is the largest island in the Marianas. It has a hilly surface with shoreline cliffs, many caves, and abrupt rises and draws. 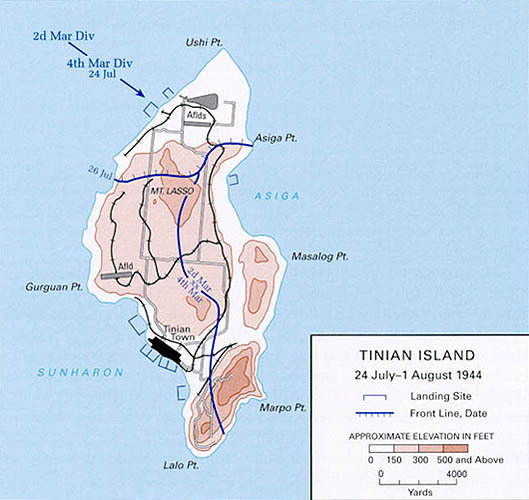 The island's position 105 miles south of Tinian gives it a more tropical climate, which for ground troops meant thicker vegetation to cut through. Unlike the rest of the Marianas, Guam had been under American jurisdiction from 1898 until the Japanese invasion of 10 December 1941, a history that lent to the island's liberation the same moral imperative as that attached to the Philippines. American leaders believed that the civilian population was still loyal to the United States and was at heart not freely cooperating with the Japanese occupiers. The American invasion of Saipan froze the defensive development of Guam in an early stage. 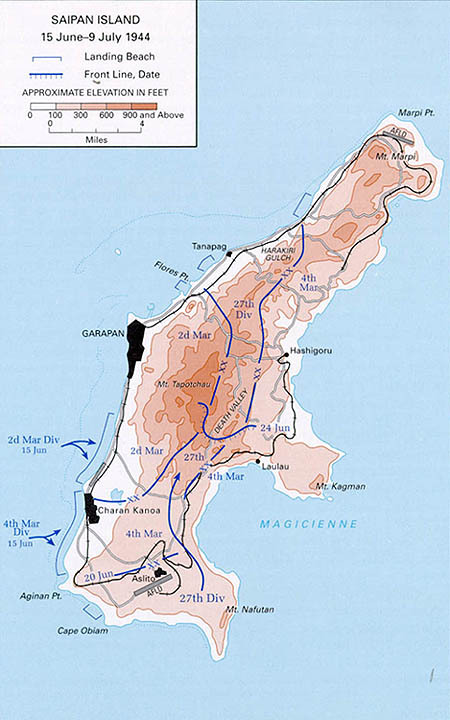 In mid-June 1944 the Japanese garrison was only about half the size of that on Saipan, with fewer artillery pieces and tanks to defend an island more than twice as large as the latter. Nevertheless, the 18,500 defending troops represented a considerable force. Of primary interest to the Americans was an airfield on Orote Peninsula, a rocky finger off the west coast. Lt. Gen. Takeshi Takashima commanded the garrison through his 29th Division staff, under the general supervision of the theater commander, Lt. Gen. Hideyoshi Obata. The American invasion of the Marianas had caught Obata on Guam, and there he would stay throughout the campaign. Admiral Spruance set the invasion date for 21 July 1944. 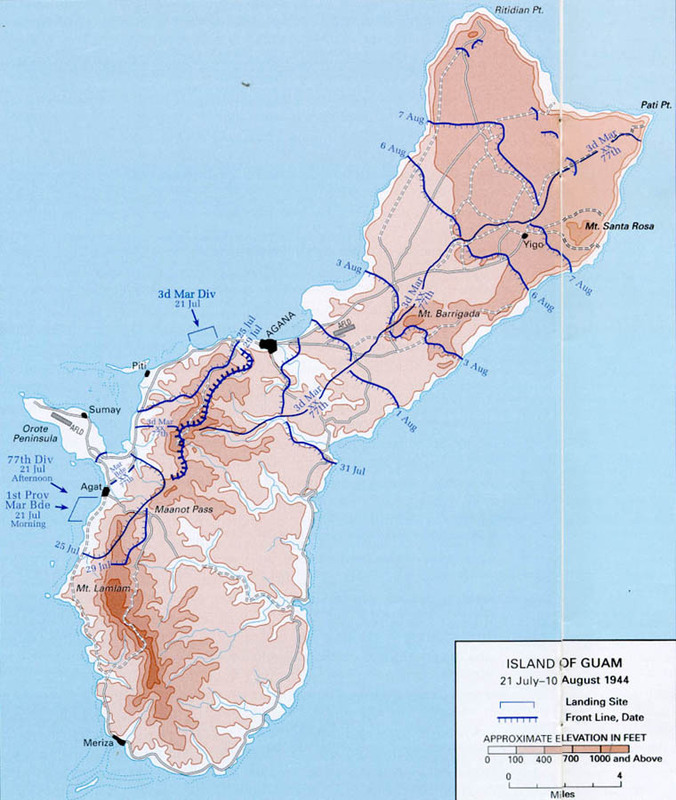 Southern Troops and Landing Force planned to take Guam with a joint multidivision force. After the 3d Marine Division and 1st Provisional Marine Brigade staked out a beachhead' the 77th Infantry Division would land and operate in its own sector. Once ashore, these units would come under command of Lt. Gen. Roy S. Geiger, USMC. Their first objective was Orote Peninsula; combat units would then push across the island, clear the southern end, and reorient for a sweep to the north coast. Japanese defenders on Guam received the heaviest "softening-up" gunfire and bombing the U.S. Navy had yet produced in the war. Beginning in March 1944, carrier task forces struck enemy bases on nearby islands, especially Truk and Woleai in the Carolines. During the two weeks before the invasion the Navy orchestrated day and night concentrations of surface gunfire from six battleships, nine cruisers, a dozen destroyers, and many rocket-launching gunboats as well as numerous strafing and bombing sorties from Army B-24s and Navy carrier-based squadrons. This preparation destroyed all naval gun positions visible from the air and about half the large guns in caves. On the morning of 21 July Marine units came ashore on both sides of Orote Peninsula. 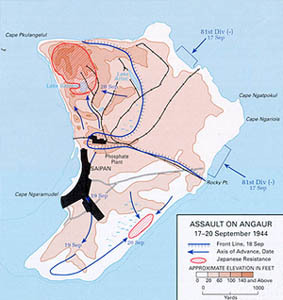 The 3d Marine Division landed on the north beach near the town of Agana, while the 1st Provisional Marine Brigade assaulted the south beach near Agat. Opposition was surprisingly heavy after weeks of preparatory fire, and twenty-two amtracs were sunk. But the marines kept coming and by nightfall had pushed about a mile inland at both points. Maj. Gen. Andrew D. Bruce's 77th Infantry Division began landing the afternoon of D-day. But even before Army troops hit the beach they had to contend with a problem the marines had not faced. Because the 77th was in corps reserve, the division had no amtracs allotted; when landing craft reached the reef line, troops had to debark and wade several hundred yards to the beach. Tanks and trucks had to be towed by bulldozers, and some were lost in the surf. 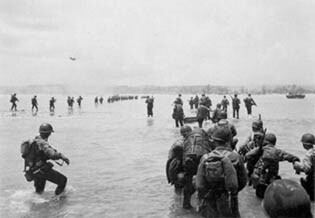 Most of the 305th Infantry was ashore by 2130, in time to help turn back the expected enemy counterattack. In its first combat on Guam, the 305th lost 7 dead and 10 wounded while, with the marines, killing 268 enemy. The next morning the regiment took a sector on the 1st Provisional Marine Brigade left and jumped off on its first mission: clearing a road inland of Agat. By the afternoon of 22 July the 77th Division had all of its field artillery ashore: the 304th, 305th, and 902d Battalions. Over the next two days the 306th and 307th Infantry regiments and General Bruce's headquarters waded in from the reef line, while troops ashore continued expanding the beachhead. 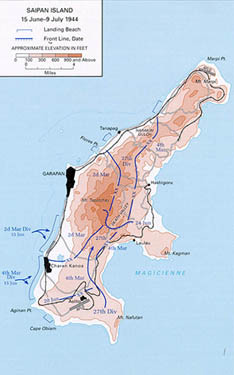 On 24 July the 77th Division took over the southern perimeter; two days later the 1st Provisional Brigade began clearing Orote Peninsula, an operation requiring five days. 21 22 nets. When it was over, the American beachhead remained intact, nearly 3,500 enemy lay dead, and the Japanese situation on Guam was hopeless. With Orote airfield under his control, General Geiger turned his attention farther inland. His troops now faced a mountainous expanse to the south and over two-thirds of the island to the north. Not knowing where the enemy would attempt a final defense, Geiger accepted Bruce's proposal to launch limited probes into the southern hills. For six days the 77th Reconnaissance Troop conducted patrols with Chamorro guides but found no enemy. His southern flank secure, Geiger reoriented to the north. 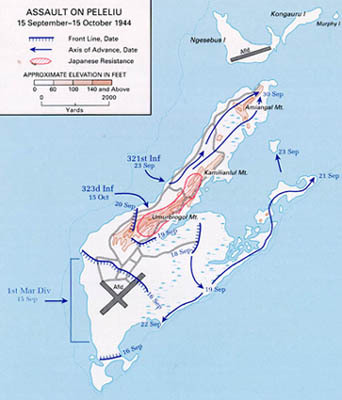 Meanwhile, on 27-28 July the Japanese had again tried to puncture the American beachhead perimeter, a failed endeavor in which they lost General Takashima to a machine gun burst. General Obata took over and frantically pulled his depleted force north to build a new defensive line. His troops were short of ammunition and rations and had only about a dozen tanks left. A few light artillery pieces remained, but the men were fast losing the strength to muscle them up and down hills. Obata tried to anchor his internal defenses on Mount Barrigada, five miles east of Agana, but American tanks punched through before his units dug in. However, as the Americans moved north, they now found the terrain and climate more formidable. Thickening rain forest opened gaps between units and ruined alignment, and heavy rains and accompanying mud added to the ensuing communications and logistical confusion. 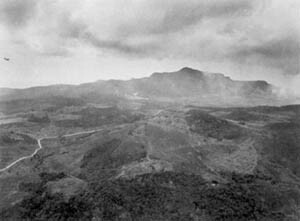 These conditions brought the 77th Division to the awkward position of holding only the eastern half of Mount Barrigada at nightfall on 3 August. Bruce's infantry took the rest of Mount Barrigada the next day, but a major breakdown in Army-Marine liaison marred the achievement. After blasting through two Japanese roadblocks, tanks and troops of the 307th Infantry came upon what looked like a third enemy position. The tankers opened fire and saw, instead of Japanese taking cover, Americans frantically waving helmets. When the tanks ceased fire, seven marines lay wounded. and there isolated enemy detachments threw themselves against Bruce's troops and the marines advancing up the island, still causing considerable casualties. On the night of 5-6 August, for example, an enemy platoon and two tanks hit the 305th Infantry, killing fifteen and wounding forty-six. By nightfall on the 6th Obata's last defensive line had collapsed. The next day the Japanese put together their last organized resistance, a roadblock with two tanks that kept the 307th Infantry out of the village of Yigo only a few hours. On the 8th the same regiment followed a naval bombardment to take the northernmost height, Mount Santa Rosa. The fight for Guam ended with the worst kind of battlefield accident: Americans firing on Americans. 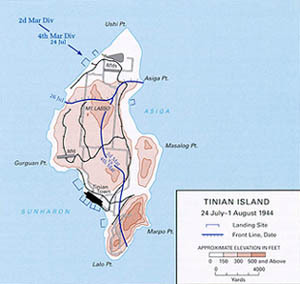 At noon on 8 August the 306th Infantry received and returned fire for two hours before discovering the source: a Marine unit on the division's left flank. Six hours later two 77th Division battalions exchanged fire but realized their error within a few minutes. Investigations revealed these firefights and the earlier 4 August incident resulted from misunderstood signals and sector boundaries. These tragic mishaps added nearly 20 casualties to the campaign total of 7,800, of whom 2,124 died in action or of wounds. The 77th Division lost 839 killed in action. On 10 August General Geiger declared resistance on Guam ended and the same day received Admirals Nimitz and Spruance for a tour of the battle-scarred island. Victory in the Marianas brought United States Army and Navy forces close to their next major objectives in the Pacific: the Philippines and the Japanese home islands. American forces were now in a position to interdict directly Japan's vital East Indies oil fields as well as to strike targets in the Philippines and Japan. Capture of the Palau Islands would allow more effective prosecution of both goals. Japanese held the Palaus with 49,000 men under Palau Sector Group and 14th Division commander Lt. Gen. Sadao Inoue, who deployed 10,500 troops on Peleliu but only 1,400 on Angaur. To take the two islands, American planners selected the Army's 81st Infantry Division and the 1st Marine Division. On the morning of 15 September, after heavy Navy surface and air preparatory fires, the 1st Marine Division came ashore on the southwest beaches of Peleliu. The marines met strong opposition but by nightfall held a beachhead nearly two miles long and a mile deep. As elsewhere, however, the Japanese defenders showed no signs of giving up. Although the marines advanced steadily and took the airfield, casualty rates after five days exceeded 50 percent in some units. By 20 September the marines were exhausted, and a stalemate had resulted. On Angaur Maj. Gen. Paul J. Mueller led the 81st Division into combat for the first time on 17 September. After a six-day Navy preparation, the 321st Infantry assaulted the southeast coast, the 322d Infantry attacked the northeast shore, and the 323d Infantry stood offshore in corps reserve. Initially mines and congestion on the cratered, shrapnel-littered beaches slowed the landing, but the 52d, 154th and 306th Engineers soon cleared and organized passable avenues inland. Spearheaded by the 710th Tank Battalion and supported by the 316th, 317th, 318th, and 906th Field Artillery Battalions, the two infantry regiments once ashore made rapid progress against sporadic opposition. By 20 September Mueller's men had split the defenders and chased most of the remaining Japanese back toward the western beaches of the tiny island. Meanwhile, on Peleliu the 1st Marine Division commander, Maj. Gen. William H. Rupertus, wrestled with a dilemma. Mindful of the wrenching Saipan controversy, he preferred that Peleliu remain an all-Marine operation. But when casualties continued to mount, he had to accept reinforcement. On 22 September the 321st Infantry transferred to Peleliu with the mission of clearing a mile-long stretch of beach and jungle-covered hills. The next day the U.S. Army unit moved inland, preceded by artillery and naval gunfire pounding the hills, while a Marine regiment leapfrogged upcoast to clear the northern tip of the island. On the 24th, Army troops found a path into the hills and named it 321st Infantry Trail. Mueller's men used the trail to split the enemy, one pocket to the south around Umurbrogol Mountain, the other north. Both would prove difficult to reduce, the former because of rough terrain, the latter because, to the shock of the Americans, General Inoue had managed to bring 500 fresh troops to Peleliu from the northern Palaus. On Angaur the 81st Division also faced two pockets of resistance. A small number of enemy were- trapped on a strip of dry ground between the southeast beach and a swamp, effectively out of the fight. But the largest number of remaining enemy defenders coalesced on "the Bowl," a hill mass around Lake Salome in the northwest. Even while elsewhere on the island the 1884th and 1887th Engineer Aviation Battalions began airfield construction, the enemy made a last stand. On 20 September the 322d Infantry and attached tanks moved against the Bowl. Rail lines serving the phosphate plant offered easy avenues into the area, but Japanese mines and artillery made their use dangerous. Inside, some 750 enemy manned artillery and antitank weapons, mortars, and machine guns, determined to fight until the end. flamethrowers, the troops used bulldozers to seal the entrances. By dusk on the 29th the floor of the Bowl had been cleared, and only a laborious mop-up of the northern rim remained. Meanwhile on Peleliu the marines had encountered unexpected opposition at the northern tip of the island. 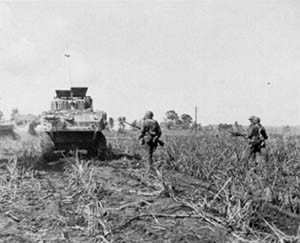 On 27 September the 321st Infantry moved north with tanks and flamethrowers to assist and then relieve the marines. After six days of cleaning out caves and draws, the 321st chased the Japanese off the last rise, and on the 30th Geiger declared both Peleliu and Angaur captured. Although American naval and air units had full access to Peleliu, Japanese troops still held the Umurbrogol Pocket. Marine infantry, armor, and artillery units hammered the pocket until 15 October, when Army units took over. The 321st Infantry moved against the northern and eastern sides of the pocket, while General Geiger sent his still fresh reserve regiment, the 323d Infantry, to the southern and western sides. Now 81st Division troops began a grueling yard-by-yard fight for the maze of jagged hills and steep cuts. Willing to try anything against the Umurbrogol Pocket, Mueller's men hit upon two effective innovations: air-delivered napalm and flamethrowers mounted on tracked landing vehicles. As reduction of the pocket continued, 81st Division troops found themselves being fired upon from points just secured. In retaking such positions, the Americans discovered the Japanese had built tunnels to connect several caves. Attempting to counter these underground complexes, the troops poured oil into crevices and ignited it with phosphorus grenades. Above ground they took care to fortify with sandbags all terrain gains, no matter how small. During the last week of October the 323d Infantry took over reduction of the pocket. The final American victory was delayed by a typhoon the first week in November, but the end was brought closer when 81st Division troops took the last fresh water source. of the Japanese. Finally, on 27 November, the 323d Infantry completed clearing the troublesome pocket and declared Peleliu secure. The struggle for Peleliu and Angaur had put Army units into some of the most difficult fighting of the entire war for territory of comparable size. Two and one-half months of fighting on the tiny islands cost the Army 542 killed and 2,736 wounded. now lay wide open, and after the Battle of the Philippine Sea the Japanese no longer had the naval air strength to counter American aircraft carrier task forces. 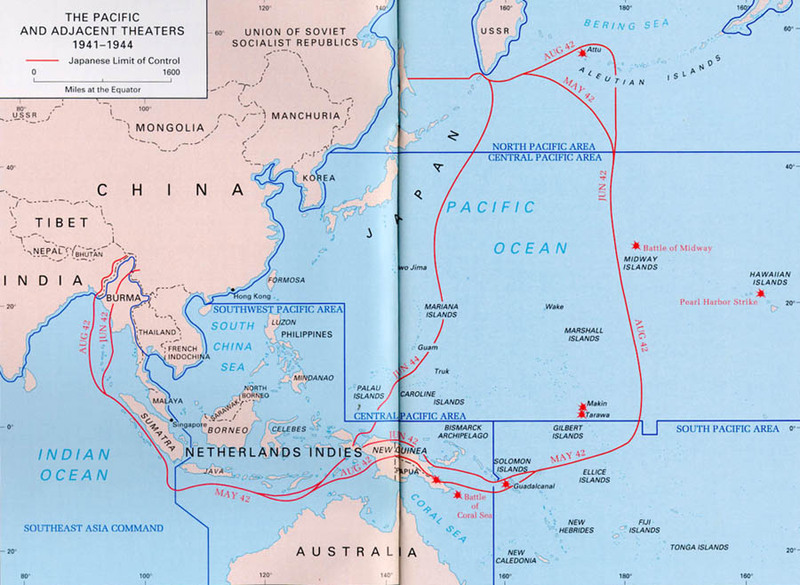 United States Army Air Forces and Navy task forces had won the bases that would allow them to sever Japan's link to the East Indies oil fields, interdict its supply lines to China, and attack the Japanese home islands themselves. Furthermore, no enemy-held territory remained between American forces and the Philippines. the 81st Division in September 1944, proved of greater value than the Palaus for Pacific Fleet operations in the Philippines and Okinawa. Beyond debate, however, is the value of experience gained by Army and Navy staffs and the three Army divisions involved in the Western Pacific Campaign. tions. But those few incidents should not obscure the cooperative planning for dozens of amphibious operations and the hundreds of instances of successful Army-Navy-Marine Corps coordination of naval gunfire, artillery, air support, and supply that occurred routinely throughout these campaigns. Proof that "Smith versus Smith" did not mortally wound Army-Navy relations in the Pacific came on Peleliu, when the 81st Division regiments first assisted and then took over reduction of the Umurbrogol Pocket from the 1st Marine Division. In some respects intelligence was a success, in others a failure. Since American aircraft enjoyed almost unopposed access to the targeted islands, aerial photographs could be examined leisurely and updated continuously. But these photos, as well as Navy reconnaissance of beaches, often revealed only larger enemy positions and not the welter of tiny but in the end deadlier infantry positions. As a result, the Americans approached each island with an unrealistic idea of how long a campaign to plan. Predictions about three operations in the Western Pacific Campaign were spectacularly off the mark. On Saipan, Holland Smith's staff believed Nafutan Peninsula was held by only about 300 stragglers, but the 105th Infantry had to kill 1,050 enemy there before the peninsula could be secured. General Mueller declared Angaur secure on the fifth day of fighting, but the battle continued thirty-one days longer. And General Rupertus expected a four-day fight for Peleliu, but decisive control of the island took sixteen days to establish, and the last enemy troops held out for two and one-half months. Army units learned much about amphibious operations in the Marianas and Palaus, but a costly problem occurred while bringing them ashore on Guam. Failure to allot landing craft to the 77th Division resulted in much time wasted and equipment lost. Many badly needed vehicles never reached the beach, having fallen into coral gaps or craters blasted by naval preparatory fires. This problem made clear the need for better scheduling of landing craft at joint planning sessions. necessitating artillery and air strikes. Another example was defensive positioning. Too often battalion commanders withdrew their units from hard-won terrain at the onset of darkness if their position appeared awkward and difficult to defend. Reflecting a rigid textbook approach to tactics, such procedures were only gradually adjusted by better knowledge of the enemy and better use of weapons and equipment, including items as simple as sandbags. Yet despite the continuing introduction of new units, real progress occurred. By the time the 77th and 81st Divisions entered combat they had much more information about the enemy and more weapons to use against him than the 27th Division had had at the beginning of the campaign. Fire support available to Army divisions in the Western Pacific overcame Japanese batteries with little difficulty, but problems with other targets, as well as with coordination, persisted. The three major sources of fire support-artillery, naval gunfire, and aircraft-were only partially effective against enemy personnel, usually because of thick vegetation and rocky terrain, and none could touch caves and tunnel complexes. The plan to use armed and armored amphibian vehicles ashore as tanks had to be set aside, since the amtracs were needed more for the ship-to-shore ferrying of supplies. Methods for requesting and adjusting fire remained controversial. Ground commanders down to battalion level wanted authority to call directly for naval and air support, but the Navy answered requests from division commanders only. As a result, ground troops normally had to wait at least half an hour for an air strike even if the planes were already overhead and several hours if on the ground. Within the Army divisions, infantry-armor coordination remained inadequate. Troops could not talk to tank crews without opening a hatch. And too often map-or terrain-reading errors brought American fire within American lines. seal caves and sandbags to hold terrain. Riflemen experimented further with sandbags, pushing them ahead as they crawled over difficult terrain on Peleliu. Innovation also marked the combat support effort. In the Marianas, Army and Navy officers discovered that DUKW landing craft, unarmed amphibious trucks, were just as valuable in ferrying supplies between ships and the front line as in bringing assault troops ashore because they could drive through the usually disorganized beach without unloading. While DUKW companies supported combat farther inland other units addressed the clutter on the beach. Engineer units filled the many craters from naval gunfire preparation and then acted as shore party personnel to manage supply dumps. A few innovations proved hasty. The practice of sealing caves with bulldozers left the possibility that trapped enemy would later emerge from undiscovered openings to harass Americans from the rear. To ensure security, infantry or engineer units had to reopen and patrol caves, a time-consuming process. A response to the unusually thick vegetation on Guam and Peleliu-regiments moving in column without flank security-also had to be reconsidered. When a lead unit overcame an enemy strongpoint and moved on, the following unit often discovered that enemy survivors had reoccupied the position, which had to be taken again. In the Western Pacific the United States Army won important victories, and in the process gained three battle-tested divisions. In the coming months veterans of the 27th, 77th, and 81st Infantry Divisions would find their hard-earned experience invaluable in the Philippines and on Okinawa. 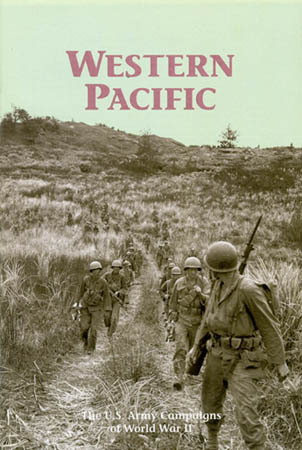 The official history of the Western Pacific Campaign has been augmented in recent years by a number of popular accounts. The "Smith versus Smith" eruption during operations on Saipan is treated in detail by Harry A. Galley in his "Howlin' Mad" vs. the Army: Conflict in Command, Saipan 1944 (1986). The same author examines the most difficult operation in the Palaus in his Peleliu 1944 (1983), which considers Angaur only briefly but includes anecdotes from all ranks and both sides. Joint operations on both Peleliu and Angaur are covered by Stanley Falk in Bloodiest Victory: Palaus (1974). 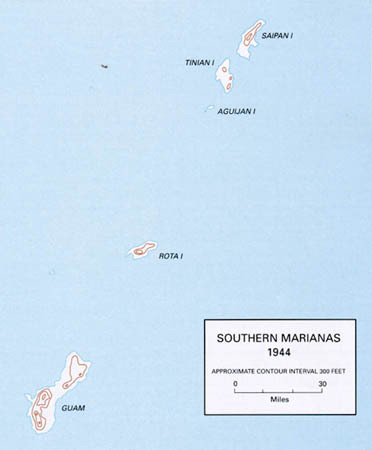 The most extensive treatment of operations in the Marianas and Palaus remains, on the former, Philip A. Crowl, Campaign in the Marianas (1960) and on the latter, Robert Ross Smith, The Approach to the Philippines (1953), chapters 19 and 21-24, both volumes in the series United States Army in World War II. Cover: Troops of the 305th Infantry, 77th Division, on Guam.